1st Day: Get morning/day flight from Jaipur(JAI) to New Delhi (DEL, after arrival Delhi transfer to Shimla via Volvo bus about 370 kms. 2nd Day: Shimla Sightseeing Tour (Kalbadevi Temple, Scandal Point, Sankat Mochan Temple, Jakhu Temple, Christ Church, and The Mall) by personal non AC cab. 3rd Day: Shimla Kufri Tour (popular for horse/yak rides) by personal non AC cab. 4th Day: Shimla to Manali Journey approx 270 kms. 5th Day: Kullu Manikaran Sightseeing Tour by personal non AC cab. 6th Day: Rohtang Pass and Solang Valley tour (famous for Skiing, Horse Riding, Yak Riding, Snow Scooter ride) by personal non AC cab. 7th Day: Local Manali tour (Hadimba Devi Temple, Manu Temple, Tibetan Monasteries and Vashist Temple), and evening return Manali to Delhi Journey by Volvo bus approx 580 kms. 8th Day: In the moring arrival at Delhi and transfer to Delhi IGI Airport (DEL) /Railway Junction (DLI) for your onward journey to Jaipur. The best way to travel from Jaipur to Shimla Manali is by bus. Because there is no direct flights and trains from Jaipur to Manali/Shimla. The most desirable way to first reach Delhi from Jaipur, and that after getting to Manali or opt for a direct train to Chandigarh from Jaipur then take a state transport bus from Chandigarh to Shimla/Manali. The best road route is National Highway 3 to reach Manali from Jaipur. via NH 3 (This route has tolls) : The driving distance between Jaipur to Manali, Himachal Pradesh by this route is approx 817 km, and Travel Time by this road route is 14 h 23 min with traffic and 13 h 4 min without traffic. ullu Manali is No.1 famous hill stations in Himachal Pradesh situated near the northern end of the picturesque Kullu valley. And you can explore the fascinating beauty of the green hills of Himachal with our Kullu Manali honeymoon package from Jaipur. India is the home of one of the most ancient civilizations. Dotted with rich kingdom, India has been referred to as ‘Dreamland for travelers’ since ages, and Kullu Manali is renowned as ‘Switzerland of India’ for honeymooners. India is known as one of the greatest canvas of lovely colors and nuances, waiting to be explored. If you’re coming to Manali from Jaipur, make sure to prior book a kullu manali hotel. Although there are a lot of hotels in Manali, but due to all season heavy rush of tourists expect monsoon, you may not find an affordable hotel easily. Our best tour itinerary helps each honeymoon couple to visit all amazing hot destinations easily and comfortably. As it is located along the banks of the Beas River, such hill towns are perfect honeymoon break from the busy chaotic lifestyle. These valleys are paradise for honeymooners. This is the main reason for it names the ‘Switzerland of India ‘. One can feel the excitement and let the adrenal rush like yourself enjoy activities such as Paragliding, rafting, fishing, climbing, mountaineering, skiing, trekking high altitude, Heli skiing, etc. 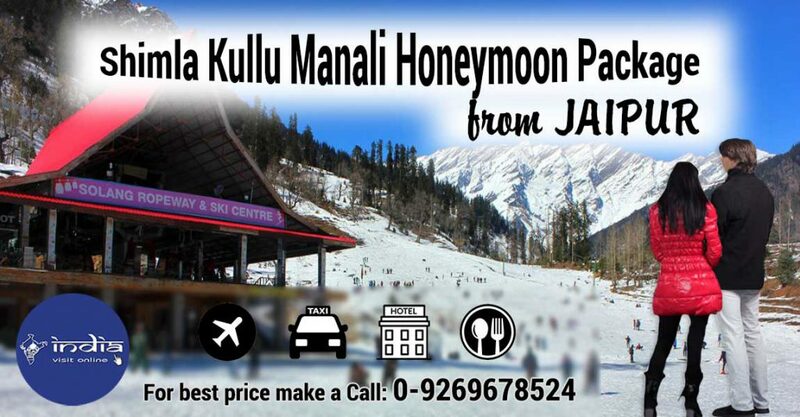 Our Kullu Manali Honeymoon Package filled with fun, laughter and excitement, what else can you expect? Check out our online Shimla Kullu Manali Tour Package from Jaipur to relish your summer winter holidays.